Mark Campbell, Stuart MacIntosh, Euan Dunbar and Robert Bryce, break the Scottish National 4 x 50m relay record with a time of 1.33.76! Aberdeen Dolphin Swimming Club is one of the oldest swimming clubs in the North East of Scotland, having been formed in the early 1960’s. It is a private, non-profit making club. Any charity events or non-swimming events can be found in our events calendar. From bag packing, barbeques and fund raising events all the details you need to know are in here. 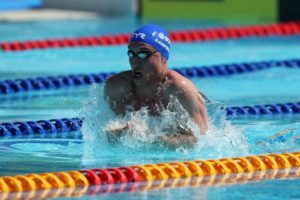 We are so proud of our Dolphin swimmer Mark Campbell who represented Scotland in the 50m Breaststroke at the Gold Coast Commonwealth Games 2018. Find out how we raise money, and how you could be a part of this process. With lots of events year round, we are always looking for new ways to raise money. For all of your business communications requirements.